Sorry for the holdup in passing on the news--the hospital's WiFi didn't play nice with the Mommy's notebook. Fortunately, there were no such incompatibilities with the delivery. Edmund was manfully ripped from his mother's womb at 2:12 PM yesterday; 5 lbs., 5 oz. and 20 inches. Penelope demurely and daintily followed at 2:14; 5lbs. 11 oz. and 20 inches. Mom and kids are all doing great. I have to get back to the hospital with a new notebook (so the Mommy can blog at you some more), so just one picture for the moment. That's Ned on the left, and Penny on the right. Thanks to everyone for the calls/e-mails/comments! AHHHH! Congratulations!!! They're beautiful - and look how awake they seem to be! Can't wait to meet 'em! So gorgeous (and handsome!). 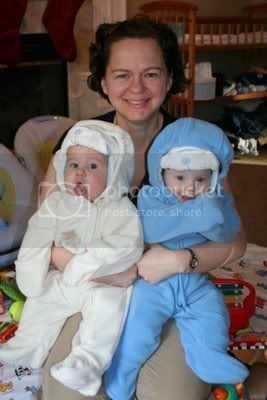 They are so cute and Mommy, you look fantastic! Love, g.
They're so cute, I almost cried! SO glad to hear of the safe arrival...I have been checking in faithfully, hoping to hear the news! Congratulations on your beautiful children. Hooray! Finally the full Esq. clan! Kisses to everyone! Hooray, congrats to the whole family, and welcome to Penny and Ned!!! I met the babies, and they are adorable! And yes, very alert! GORGEOUS!!!!! I am so happy for you both! Congrats! I'm so jealous that I haven't seen them in person yet. Much love from Aunt Rachel and Uncle Shane!!! Congratulations! They are gorgeous! Enjoy every moment. Congrats!!!! I have been checking this blog obsessively for updates and thinking of you. They are absolutely beautiful!!!!! Can't wait to meet them! now that i've seen them in person i can confirm that they are perfect and beautiful and just amazing. mommy looks beautiful and daddy is such a champ, he jumps right in there. today i called him "the baby whisperer' because he was the only one who could get penny to calm down. m and d are going to be amazing parents. Yay! Congratulations! I can't wait to meet them in person and until then, get more pictures!! Congratulations! Those are so precious and I'm so very glad to hear they are healthy (and healthy mama). Congratulations! May they fill your life with love and laughter. Welcome to the world, Ned & Penny!